Dentistry is a fitting field for Dr Ives as she loves meeting new people and has always liked working with her hands. While she’s highly skilled in many areas of dentistry, Dr Ives is most interested in orthodontics and cosmetic dentistry. 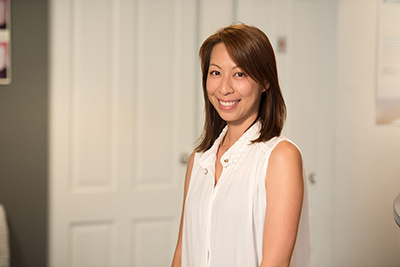 Dr Ives graduated with honours from Sydney University in 2002 with a Bachelor of Dental Surgery. She also serves as an associate lecturer in clinical dentistry as well as oral surgery at the University. Outside of Just White Dental, Dr Ives enjoys helping out at her two sons’ local primary school. She also likes tennis and is a big fan of Roger Federer. She also enjoys shopping at Bunnings for DIY projects and IKEA. Achieve a healthy, beautiful smile by booking an appointment with Dr Ives today!